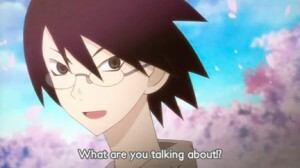 Nozomu Itoshki is a very pessimistic school teacher who, at the very beginning of the series, tries to hang himself on a Cherry Blossom tree. 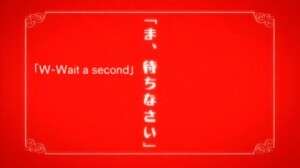 Despite this effort of self-destruction, he is saved by an extremely optimistic girl known only as Kafuka Fuura (though in her effort to save his life, she almost kills him). She explains to him that it is simply unimaginable that he would hang himself on such a nice day, especially in front of such beautiful trees. 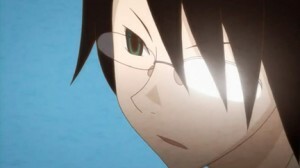 She decides to nickname Nozomu “Pink Supervisor” and offers to pay him fifty yen to call him by that nickname. 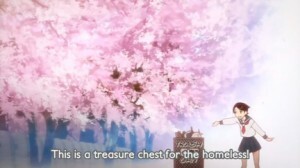 After having enough of the strange girl, Nozomu bolts to the school and starts his homeroom class, but the attempt to escape was in vain as he finds that the girl is one of his students. 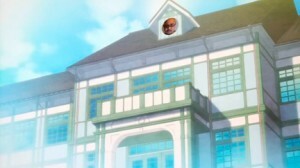 Not only that, but Kafuka is just the tip of the iceberg: each and every student in his class represents a new personality quirk or bizarre obsession, posing challenges that the suicidally-inclined teacher must overcome in spite of himself. 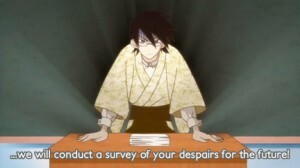 Sayonara Zetsubou Sensei comedy relies mostly on its speech and its onscreen text, though I think that most of the text that comes onscreen is not really supposed to be fully read because the text stays on the screen for only a few milliseconds. But the reading and talking is something I don’t mind because the fast pace of the series just make the series more chaotic and funny. Though most of the humor is hard to understand unless you know (or love in my case) Japanese culture. 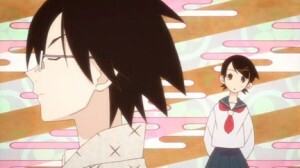 I also like Sayonara Zetsubou Sensei because of the drawing style. The series is drawn in many styles, but the main drawing style is a simple iconic and graphic style that gets basic figures and humor across easily. 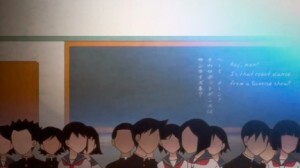 Sayonara Zetsubou Sensei mostly uses stereotypes of all the main characters to explain the humor. 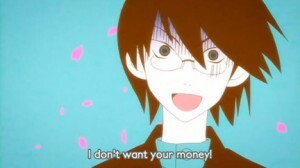 For example, a Japanese stereotype would be a hikikimori (a shut-in). Hikikimori’s are common everywhere, but they are more of a problem in Japan. 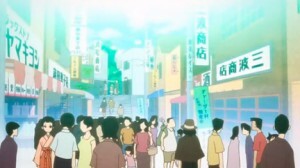 The series pokes fun at Japans problems by using these stereotypes. 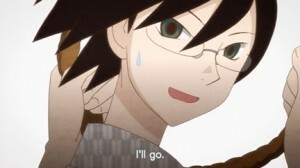 Continuing on with the hikikimori example, Nozomu is told by the school consular to visit one of his students who is a hikikimori and try to convince the hikikimori to come back to school. 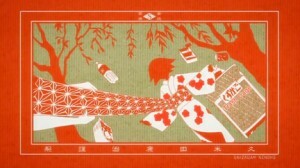 But instead of trying to convince the hikikimori, Fuura (an over positive girl) tells Nozomu that the hikikimori is actually a Zashiki Warashi (a child-like ghost that brings good fortune to a house) and that if the hikikimori leaves the house the family will loose all their good fortune which is obviously untrue, but Nozomu goes with what Fuura says anyway. So Nozomu and Fuura come up with a plan to keep the hikikimori inside her room. They board up the hikikimori’s door to her room and put scary dolls outside of her room, but the plan backfires and the hikikimori begs Nozomu and Fuura to let her go outside because she got so scared from what Nozomu and Fuura did to her. But then after Nozomu tells her that anytime she wants to commit suicide to call him so they can both commit suicide together because the hikikimori is pretty, the hikikimori falls in love with Nozomu. So everyone thinks that the hikikimori is cured, but actually she becomes a hikikimori at the school because she loves Nozomu. And the anime series gets even crazier than that.